← Time to dust off the old blog! Well it looks like Mother Nature has finally decided to remind us what winter should look like! The store shelves have been empty since Wednesday night in anticipation of the big storm coming tonight/tomorrow here in NJ. No fear! I’m sure you have plenty of fabric in your stash to keep you from getting bored! How about getting ready for Valentine’s Day? You should be snowed in for just about the right amount of time to make something to sweeten up the table! My pattern for this little table-runner is available to download from my Craftsy site so you don’t have to worry about getting stuck in the snow! My friends kid me that I can’t make a quilt without a star in it. What can I say? I love my stars! The runner measures 12″ x 40″. The 4″ hearts are quickly and easily foundation-pieced and then surrounded by half square triangles and flying geese units. I had these beautiful fabrics leftover from some other projects I made for EBI Fabrics. The collection is called Winter Garden designed by Katia Hoffman. 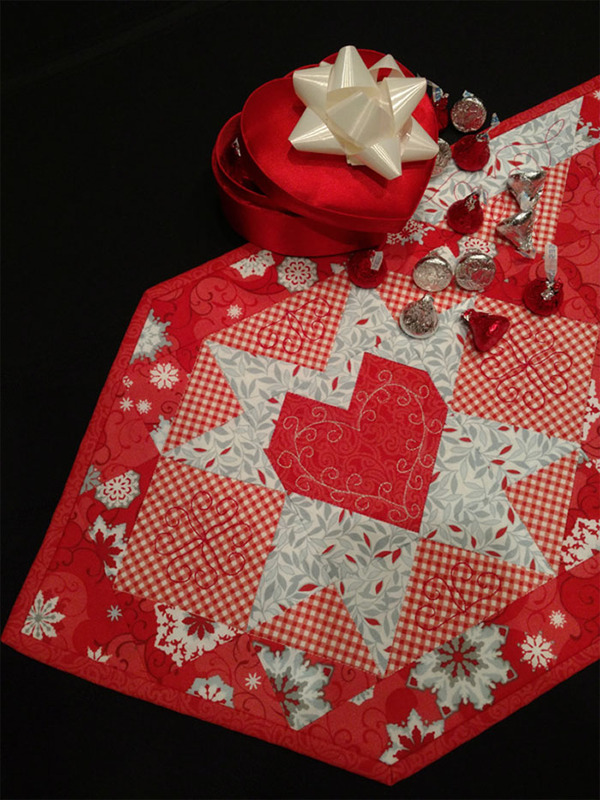 I quilted the runner using Aurifil 50wt thread in grey and red. You can see the quilting a bit better in this close-up. Maybe while I’m snowed in I’ll work on inserting a shamrock into those stars for St. Patty’s Day! What do you think? Happy quilting and stay warm inside!